On board an Aqua Expeditions’ Amazon river cruise, guests get to experience the world’s most biodiverse land ecosystem in the most intriguing and rewarding way alongside top naturalist guides. An intimate experience with wildlife, nature and culture is made possible by our small-group excursions of no larger than 8, which limit our footprint on the environment and transforms an Amazon cruise adventure into a deeply personal experience. Led by our naturalist guides, venture into the world’s richest land ecosystem with a wealth of knowledge. Small-group excursions into the Amazon jungle from the Aria Amazon showcase the unique Amazon wildlife, birds and plant life of this rich habitat. Aqua Expeditions customized aluminum motorized launch boats, or skiffs, take up to eight passengers in each on two to three daily excursions deep into Amazonia’s snaking tributaries, in search of armored catfish, red-bellied piranhas, and the beady-eyed heads of spectacled caimans in the enigmatic black waters. Just as captivating is the scene above water where yellow-spotted Amazon river turtles meander along the muddy shoreline, sapphire blue beaked Amazon kingfishers streak past, and antediluvian prehistoric hoatzin birds alight on high branches in close proximity to dusky titi monkeys frolicking in the tree canopy. 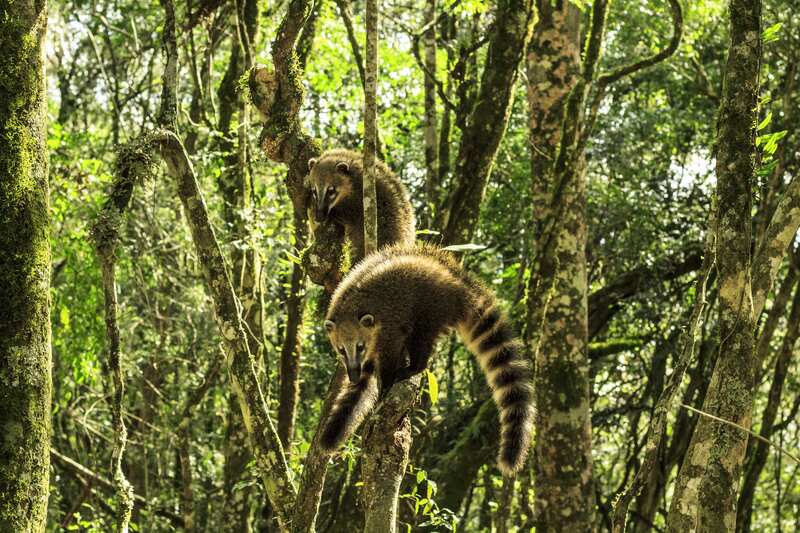 Every guest aboard an Aqua Expeditions Amazon river cruise receives an exclusive Wildlife Checklist that gives the lowdown on all the species that can be spotted on an Aqua Expeditions Amazon river cruise. Each species is also ‘rated’ by the probability of sighting in each season. Check off this useful list on your excursions and compare notes with your travel companion(s)! Closest to its source, the mighty Andes mountains, the Amazon river is as pristine as Amazon’s waters get. This makes it perfect for a wide range of water activities and excursions. Guests can also try kayaking the calm waters of the Amazon River while keeping an eye out for Amazon wildlife or even try fishing for piranhas. Whether you’re new to fishing or you’re a passionate wrangler, catching vibrant red-bellied piranhas in the black waters of the Pacaya River will get the adrenaline pumping! Kayaking and canoeing excursions are available in both the Low Water and High Water Seasons. Let our experienced guides also take you by skiff to one of the most beautiful natural freshwater swimming pools on Earth. Take a dip in the Amazon’s warm, welcoming waters, cosseted by lush tropical rainforest. Even though the Amazonian piranhas look like they pack deadly force with their razor-sharp teeth, the locals eagerly put them on their dining plate without much hassle. Follow our guides and discover the Amazon’s piranha habitats and try line fishing for these small yet fearsome aquatic creatures. In accordance with Aqua Expeditions safety policies and environmental conservation and responsible travel guidelines, these skiffs are equipped with the latest Mercury 60 HP Marine Outboard engines, which operate at ultra-low emissions levels as certified by the California Air Resources Board. These energy-efficient vessels produce 65 percent lower emissions than required by the United States Environmental Protection Agency standards. Captains on board are constant radio contact with the Aria Amazon to ensure the safety of our guests while they explore the Amazon. In the high water season, many of the itineraries’ wildlife spotting excursions will take place aboard these launch boats. 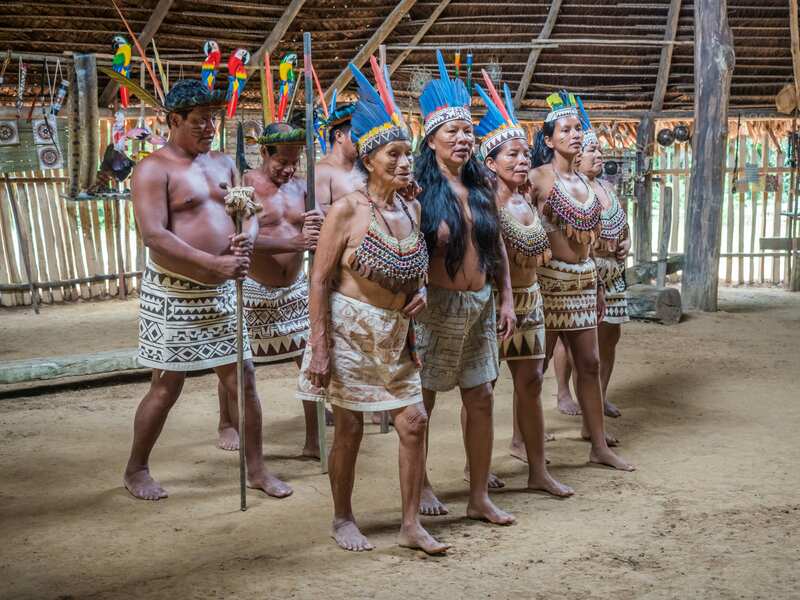 The Peruvian Amazon is home to about 200 communities, each offering a fascinating glimpse into a way of life in harmony with the river and rainforest. The inhabitants along the riverbanks in Amazonia are known as ribereños and consist of a mélange of ethnic groups that includes detribalized natives, mestizos, and those of European descent. They are transitional communities, which have neither the benefits of a traditional tribal community with its medicine man nor the benefits of modern civilization with its available medical care, except for annual immunizations and elementary schooling. The ribereños live on a rich floodplain that annually undergoes drastic environmental change. Because of this they have become resilient and adaptable to other changes as well, including social, economic, and environmental factors. Cruising the Amazon river, we see the ribereños almost every day. For village visits, Aqua Expeditions plans visits to a different village on every journey. This arrangement prevents a village from becoming commercialized and helps encourage and preserve the original way of life. It also lets us carry out regular health checks and take note of each village’s needs and concerns as they arise. Guests aboard the Aria Amazon have the opportunity to visit the Manatee Rescue Centre in Iquitos, an important non-profit and locally-run establishment dedicated to rescuing orphaned manatees and rehabilitating these gentle giants of the Amazon River. Besides learning about manatee rescue and their eventual release back into the wild, guests are also given the chance to feed these adorable creatures.